People think mathematics is mostly counting and arithmetic. It’s what we get at when we say “do the math[s]”. It’s why the mathematician in the group is the one called on to work out what the tip should be. Heck, I attribute part of my love for mathematics to a Berenstain Bears book which implied being a mathematician was mostly about adding up sums in a base on the Moon, which is an irresistible prospect. In fact, usually counting and arithmetic are, at least, minor influences on real mathematics. There are legends of how catastrophically bad at figuring mathematical genius can be. But usually isn’t always, and this week I’d like to show off a case where counting things and adding things up lets us prove something interesting. No, not four. I imagine anyone interested enough to read a mathematics blog knows the four-color map theorem. It says that you only need four colors to color a map. That’s true, given some qualifiers. No discontiguous chunks that need the same color. Two regions with the same color can touch at a point, they just can’t share a line or curve. The map is on a plane or the surface of a sphere. Probably some other requirements. I’m not going to prove that. Nobody has time for that. The best proofs we’ve figured out for it amount to working out how every map fits into one of a huge number of cases, and trying out each case. It’s possible to color each of those cases with only four colors, so, we’re done. Nice but unenlightening and way too long to deal with. The five-color map theorem is a lot like the four-color map theorem, with this difference: it says that you only need five colors to color a map. Same qualifiers as before. Yes, it’s true because the four-color map theorem is true and because five is more than four. We can do better than that. We can prove five colors are enough even without knowing whether four colors will do. And it’s easy. The ease of the five-color map theorem gave people reason to think four colors would be maybe harder but still manageable. The proof I want to show uses one of mathematicians’ common tricks. It employs the same principle which Hercules used to slay the Hydra, although it has less cauterizing lake-monster flesh with flaming torches, as that’s considered beneath the dignity of the Academy anymore except when grading finals for general-requirements classes. The part of the idea we do use is to take a problem which we might not be able to do and cut it down to one we can do. Properly speaking this is a kind of induction proof. In those we start from problems we can do and show that if we can do those, we can do all the complicated problems. But we come at it by cutting down complicated problems and making them simple ones. So suppose we start with a map that’s got some huge number of territories to color. I’m going to start with the United States states which were part of the Dominion of New England. As I’m sure I don’t need to remind any readers, American or otherwise, this was a 17th century attempt by the English to reorganize their many North American colonies into something with fewer administrative irregularities. It lasted almost long enough for the colonists to hear about it. At that point the Glorious Revolution happened (not involving the colonists) and everybody went back to what they were doing before. States which, in their 17th-century English colonial form, were part of the Dominion of New England (1685-1689). More or less. If I’ve messed up don’t tell me as it doesn’t really matter for this problem. There’s eight regions here, eight states, so it’s not like we’re at the point we can’t figure how to color this with five different colors. That’s all right. I’m using this for a demonstration. Pretend the Dominion of New England is so complicated we can’t tell whether five colors are enough. Oh, and a spot of lingo: if five colors are enough to color the map we say the map is “colorable”. We say it’s “5-colorable” if we want to emphasize five is enough colors. So imagine that we erase the border between Maine and New Hampshire. Combine them into a single state over the loud protests of the many proud, scary Mainers. But if this simplified New England is colorable, so is the real thing. There’s at least one color not used for Greater New Hampshire, Vermont, or Massachusetts. We give that color to a restored Maine. If the simplified map can be 5-colored, so can the original. Maybe we can’t tell. Suppose the simplified map is still too complicated to make it obvious. OK, then. Cut out another border. How about we offend Roger Williams partisans and merge Rhode Island into Massachusetts? Massachusetts started out touching five other states, which makes it a good candidate for a state that needed a sixth color. With Rhode Island reduced to being a couple counties of the Bay State, Greater Massachusetts only touches four other states. It can’t need a sixth color. There’s at least one of our original five that’s free. OK, but, how does that help us find a color for Rhode Island? Maine it’s easy to see why there’s a free color. But Rhode Island? Well, it’ll have to be the same color as either Greater New Hampshire or Vermont or New York. At least one of them has to be available. Rhode Island doesn’t touch them. 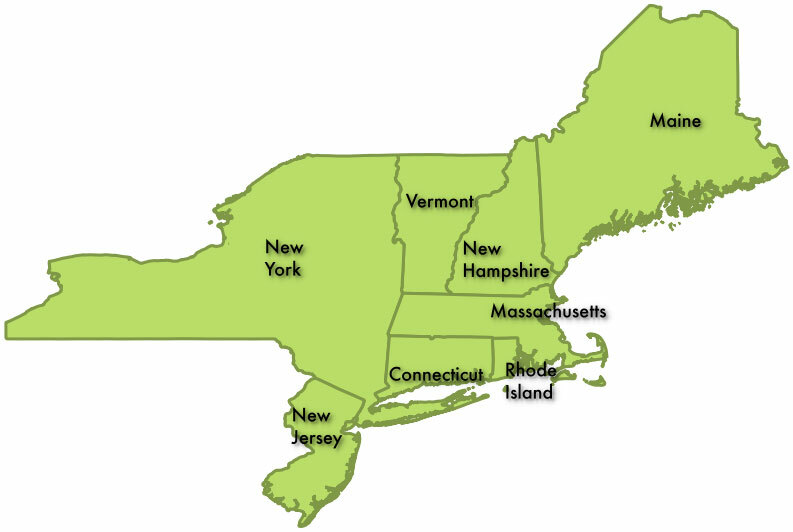 Connecticut’s color is out because Rhode Island shares a border with it. Same with Greater Massachusetts’s color. But we’ve got three colors for the taking. But is our reduced map 5-colorable? Even with Maine part of New Hampshire and Rhode Island part of Massachusetts it might still be too hard to tell. There’s six territories in it, after all. We can simplify things a little. Let’s reverse the treason of 1777 and put Vermont back into New York, dismissing New Hampshire’s claim on the territory as obvious absurdity. I am never going to be allowed back into New England. This Greater New York needs one color for itself, yes. And it touches four other states. But these neighboring states don’t touch each other. A restored Vermont could use the same color as New Jersey or Connecticut. Greater Massachusetts and Greater New Hampshire are unavailable, but there’s still two choices left. And now look at the map we have remaining. There’s five states in it: Greater New Hampshire, Greater Massachusetts, Greater New York, Regular Old Connecticut, and Regular old New Jersey. We have five colors. Obviously we can give the five territories different colors. This is one case, one example map. That’s all we need. A proper proof makes things more abstract, but uses the same pattern. Any map of a bunch of territories is going to have at least one territory that’s got at most five neighbors. Maybe it will have several. Look for one of them. If you find a territory with just one neighbor, such as Maine had, remove that border. You’ve got a simpler map and there must be a color free for the restored territory. If you find a territory with just two neighbors, such as Rhode Island, take your pick. Merge it with either neighbor. You’ll still have at least one color free for the restored territory. With three neighbors, such as Vermont or Connecticut, again you have your choice. Merge it with any of the three neighbors. You’ll have a simpler map and there’ll be at least one free color. If you have four neighbors, the way New York has, again pick a border you like and eliminate that. There is a catch. You can imagine one of the neighboring territories reaching out and wrapping around to touch the original state on more than one side. Imagine if Massachusetts ran far out to sea, looped back through Canada, and came back to touch New Jersey, Vermont from the north, and New York from the west. That’s more of a Connecticut stunt to pull, I admit. But that’s still all right. Most of the colonies tried this sort of stunt. And even if Massachusetts did that, we would have colors available. It would be impossible for Vermont and New Jersey to touch. We’ve got a theorem that proves it. Yes, it’s the Jordan Curve Theorem, here to save us right when we might get stuck. Just like I promised last week. In this case some part of the border of New York and Really Big Massachusetts serves as our curve. Either Vermont or New Jersey is going to be inside that curve, and the other state is outside. They can’t touch. Thank you. If you have five neighbors, the way Massachusetts has, well, maybe you’re lucky. We are here. None of its neighboring states touches more than two others. We can cut out a border easily and have colors to spare. But we could be in trouble. We could have a map in which all the bordering states touch three or four neighbors and that seems like it would run out of colors. Let me show a picture of that. A hypothetical map with five regions named by an uninspired committee. So this map looks dire even when you ignore that line that looks like it isn’t connected where C and D come together. Flood fill didn’t run past it, so it must be connected. It just doesn’t look right. Everybody has four neighbors except the province of B, which has three. The province of A has got five. What can we do? So there we have it. As long as we have a map that has some provinces with up to five neighbors, we can reduce the map. And reduce it again, if need be, and again and again. Eventually we’ll get to a map with only five provinces and that has to be 5-colorable. Just … now … one little nagging thing. We’re relying on there always being some province with at most five neighbors. Why can’t there be some horrible map where every province has six or more neighbors? Counting will tell us. Arithmetic will finish the job. But we have to get there by way of polygons. 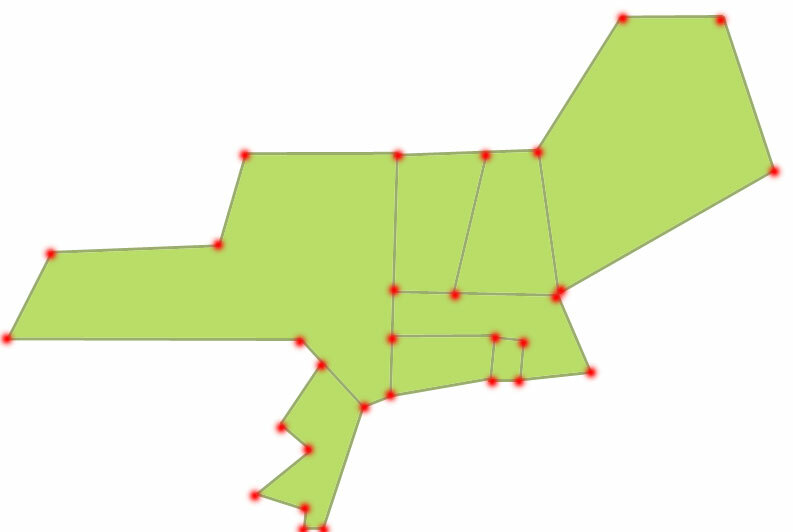 That is, the easiest way to prove this depends on a map with boundaries that are all polygons. That’s all right. Polygons are almost the polynomials of geometry. You can make a polygon that looks so much like the original shape the eye can’t tell the difference. Look at my Dominion of New England map. That’s computer-rendered, so it’s all polygons, and yet all those shore and river boundaries look natural. But what makes up a polygon? Well, it’s a bunch of straight lines. We call those ‘edges’. Each edge starts and ends at a corner. We call those ‘vertices’. These edges come around and close together to make a ‘face’, a territory like we’ve been talking about. We’re going to count all the regions that have a certain number of neighboring other regions. Specifically, F2 will represent however many faces there are that have two sides. F3 will represent however many faces there are that have three sides. F4 will represent however many faces there are that have four sides. F10 … yeah, you got this. One thing you didn’t get. The outside counts as a face. We need this to make the count come out right, so we can use some solid-geometry results. In my map that’s the vast white space that represents the Atlantic Ocean, the other United States, the other parts of Canada, the Great Lakes, all the rest of the world. So Maine, for example, belongs to F2 because it touches New Hampshire and the great unknown void of the rest of the universe. Rhode Island belongs to F3 similarly. New Hampshire’s in F4. How do we know? It comes from Euler’s Formula, which starts out describing the ways corners and edges and faces of a polyhedron fit together. Our map, with its polygon on the surface of the sphere, turns out to be just as good as a polyhedron. It looks a little less blocky, but that doesn’t show. Always true. Try drawing some maps yourself, using simple straight lines, and see if it works. For that matter, look at my Really Really Simplified map and see if it doesn’t hold true still. A very simplified blocky diagram of my Dominion of New England, with the vertices and edges highlighted so they’re easy to count if you want to do that. Here’s one of those insights that’s so obvious it’s hard to believe. Every edge ends in two vertices. Three edges meet at every vertex. (We don’t have more than three territories come together at a point. If that were to happen, we’d change the map a little to find our coloring and then put it back afterwards. Pick one of the territories and give it a disc of area from the four or five or more corners. The troublesome corner is gone. Once we’ve done with our proof, shrink the disc back down to nothing. Coloring done!) And therefore . A polygon has the same number of edges as vertices, and if you don’t believe that then draw some and count. Every edge touches exactly two regions. Every vertex touches exactly three edges. So we can rework Euler’s formula. Multiply it by six and we get . And from doubling the equation about edges and vertices equation in the last paragraph, . So if we break up that 6E into 4E and 2E we can rewrite that Euler’s formula again. It becomes . 6V – 4E is zero, so, . Do we know anything about F itself? Well, yeah. . The number of faces has to equal the sum of the number of faces of two edges, and of three edges, and of four edges, and of five edges, and of six edges, and on and on. Counting! Do we know anything about how E and F relate? Well, yeah. A polygon in F2 has two edges. A polygon in F3 has three edges. 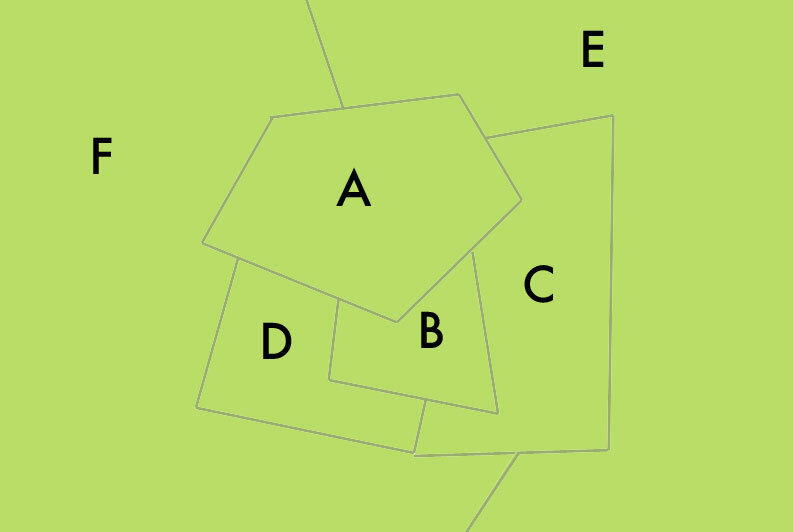 A polygon in F4 has four edges. And each edge runs up against two faces. So therefore . This goes on forever but that’s all right. We don’t need all these terms. Because here’s what we do have. We know that . And we know how to write both E and F in terms of F2, F3, F4, and so on. We’re going to show at least one of these low-subscript Fsomethings has to be positive, that is, there has to be at least one of them. And now look at that. Each Fsubscript has to be zero or a positive number. You can’t have a negative number of shapes. If you can I don’t want to hear about it. Most of those Fsubscript‘s get multiplied by a negative number before they’re added up. But the sum has to be a positive number. There’s only one way that this sum can be a positive number. At least one of F2, F3, F4, or F5 has to be a positive number. So there must be at least one region with at most five neighbors. And that’s true without knowing anything about our map. So it’s true about the original map, and it’s true about a simplified map, and about a simplified-more map, and on and on. And that is why this hydra-style attack method always works. We can always simplify a map until it obviously can be colored with five colors. And we can go from that simplified map back to the original map, and color it in just fine. Formally, this is an existence proof: it shows there must be a way to color a map with five colors. But it does so the devious way, by showing a way to color the map. We don’t get enough existence proofs like that. And, at its critical point, we know the proof is true because we can count the number of regions and the number of edges and the number of corners they have. And we can add and subtract those numbers in the right way. Just like people imagine mathematicians do all day. Properly this works only on the surface of a sphere. Euler’s Formula, which we use for the proof, depends on that. We get away with it on a piece of paper because we can pretend this is just a part of the globe so small we don’t see how flat it is. The vast white edge we suppose wraps around the whole world. And that’s fine since we mostly care about maps on flat surfaces or on globes. If we had a map that needed three dimensions, like one that looked at mining and water and overflight and land-use rights, things wouldn’t be so easy. Nor would they work at all if the map turned out to be on an exotic shape like a torus, a doughnut shape. But this does have a staggering thought. Suppose we drew boundary lines. And suppose we found an arrangement of them so that we needed more than five colors. This would tell us that we have to be living on a surface such as a torus, the doughnut shape. We could learn something about the way space is curved by way of an experiment that never looks at more than where two regions come together. That we can find information about the whole of space, global information, by looking only at local stuff amazes me. I hope it at least surprises you. From fiddling with this you probably figure the four-color map theorem should follow right away. Maybe involve a little more arithmetic but nothing too crazy. I agree, it so should. It doesn’t. Sorry. How awful: I want to follow along the math, but my overriding interest in geography blocks my mind. Aw, I knew there’d be trouble when I tossed in so many state boundary jokes in one essay. But there’s something so compelling in looking at maps, isn’t there? I ultimately have no regrets about this. I agree that maps – of any kind – are compelling. You are lucky to be involved into GIS, that was always amazing to me. Computers and maps, together. I admit I should appreciate my position better. It’s well-suited for me in a great many ways, although I’d like to be back in academia if I could. I haven’t yet had enough experience with students to be fed up with them.